(Paul Sancya | The Associated Press) This July 26, 2016, file photo shows former head of the Democratic National Committee Donna Brazile speaking during the second day of the Democratic National Convention in Philadelphia. Brazile says she considered replacing Hillary Clinton as the party’s presidential nominee with then-Vice President Joe Biden. She makes the revelation in a memoir being released Tuesday, Nov. 7, 2017. This is according to The Washington Post, which obtained an advance copy of the book. 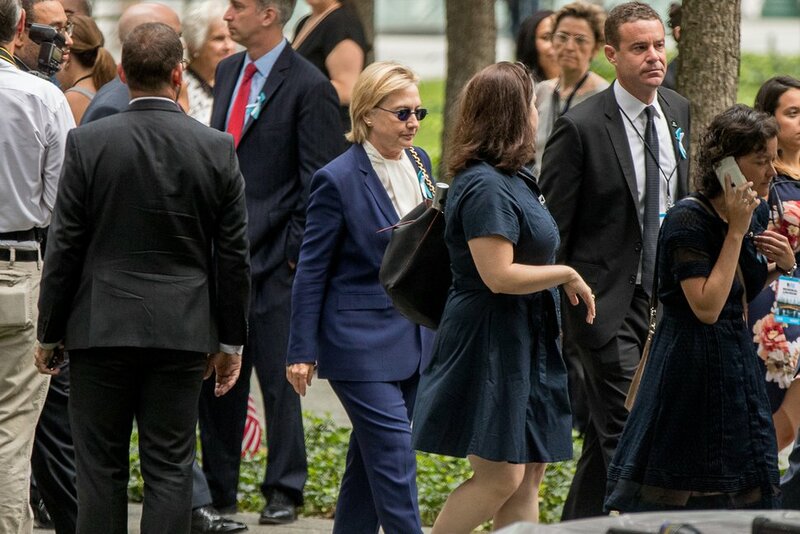 Former Democratic National Committee head Donna Brazile writes in a new book that she seriously contemplated setting in motion a process to replace Hillary Clinton as the party's 2016 presidential nominee with then-Vice President Joe Biden in the aftermath of Clinton's fainting spell, in part because Clinton's campaign was "anemic" and had taken on "the odor of failure." In an explosive new memoir, Brazile details widespread dysfunction and dissension throughout the Democratic Party, including secret deliberations over using her powers as interim DNC chairwoman to initiate the process of removing Clinton and running mate Sen. Tim Kaine, Va., from the ticket after Clinton's Sept. 11, 2016, collapse in New York City. Brazile writes that she considered a dozen combinations to replace the nominees and settled on Biden and Sen. Cory Booker, N.J., the duo she felt most certain would win over enough working-class voters to defeat Republican Donald Trump. But then, she writes, "I thought of Hillary, and all the women in the country who were so proud of and excited about her. I could not do this to them." A veteran operative and television pundit who had long served as DNC's vice chairwoman, Brazile abruptly and, she writes, reluctantly took over in July 2016 for chairwoman Debbie Wasserman Schultz. The Florida congresswoman was ousted from the DNC on the eve of the party convention after WikiLeaks released stolen emails among her and her advisers that showed favoritism for Clinton during the competitive primaries. At first, Brazile writes of the hacking, top Democratic officials were "encouraging us not to talk about it." But she says a wake-up moment came when she visited the White House in August 2016, for President Barack Obama's 55th birthday party. National security adviser Susan Rice and former attorney general Eric Holder Jr. separately pulled her aside to urge her to take the Russian hacking seriously, which she did, she writes. 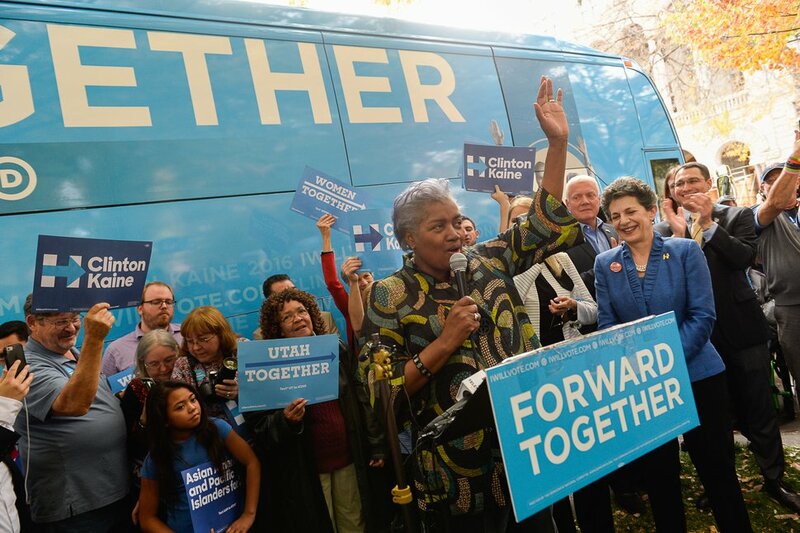 Francisco Kjolseth | The Salt Lake Tribune Donna Brazile, chairwoman of the DNC, acknowledges the crowd gathered during a rally stop at the Salt Lake City and County building in support of Hillary Clinton and other Democrat races on Thursday, Oct. 27, 2016. The DNC charter states that the chair would have to confer with Democratic members of Congress and governors and report to the full DNC, which is authorized to fill the vacancy. The morning of Sept. 12, Brazile got a call from Biden's chief of staff saying the vice president wanted to speak with her. She recalls thinking, "Gee, I wonder what he wanted to talk to me about?" Jeff Weaver, campaign manager for Sen. Bernie Sanders, I-Vt., called, too, to set up a call with his boss, and former Maryland governor Martin O'Malley sent her an email. Many of Clinton's senior staff were women, including Mook's chief of staff, as well as campaign co-chairwoman Huma Abedin.